REGISTRATION REQUIRED: Go to EventBrite to register. Please only register if you can attend the entire day. We will send a link to facilitate carpooling a few days before the retreat since parking is limited. Directions and information will be emailed to you once you register. Mystics of all traditions have gone to wild places to seek deeper wisdom. During this daylong retreat, we will focus on waking up our animal aliveness. Within us is the capacity for vivid, sensitive, connected presence. We will use exercises from animal tracking training to attune our senses to the redwood forest and to become a part of the natural landscape. Meditations will include sound, sight, touch and smell. We will learn how to walk like a native forest-dweller, bringing animal aliveness to both natural movement and alert stillness. Our true nature is innately wild and free, interrelated with all life. Too often our senses are dulled and our minds distracted, creating a chronic state of disconnection, lack of ease, and discontent. By connecting with our alive presence we can discover our true nature beyond self and separation. This day will be devoted to breaking out of the prison of our conditioned thoughts and habits, the tyranny of “selfing” and “doing,” to feel instead the aliveness and mystery of being. 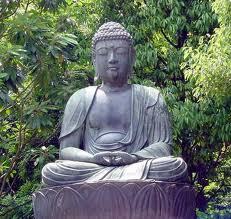 The Buddha repeatedly instructed his followers to go to the forest to meditate. Come practice among old trees and new growth, allowing the stillness of the forest to deepen our meditation. We will slow down and move at the speed of life. We will become silent, so we can listen to our inner and outer experience. We will pay attention with all our senses, so that awareness can strengthen. The redwoods, madrones and oaks will teach us their secret of presence. We will meet outdoors in a lovely natural amphitheater surrounded by redwoods in the Santa Cruz Mountains of Ben Lomond, CA. Although mindfulness meditation instructions will be included, this retreat is primarily for people with an established mindfulness practice who wish to refresh their experience. There will be guided sitting and moving meditations, as well as teachings and Q & A. Bring a bag lunch and wear comfortable layered clothing. Join us for meditation without walls. BY DONATION. No fee is charged. Registration is required. This retreat is offered on a donation basis. There is a suggested sliding scale donation of $75-200. More or less is gratefully accepted. No one will be turned away for lack of funds. Non-monetary donations are also accepted. Checks are written to “Bloom of the Present.” Donations are tax-deductible.